Home Altcoins zcash ZCash (ZEC Token) in 2018 – Up After It’s Security Upgrades? 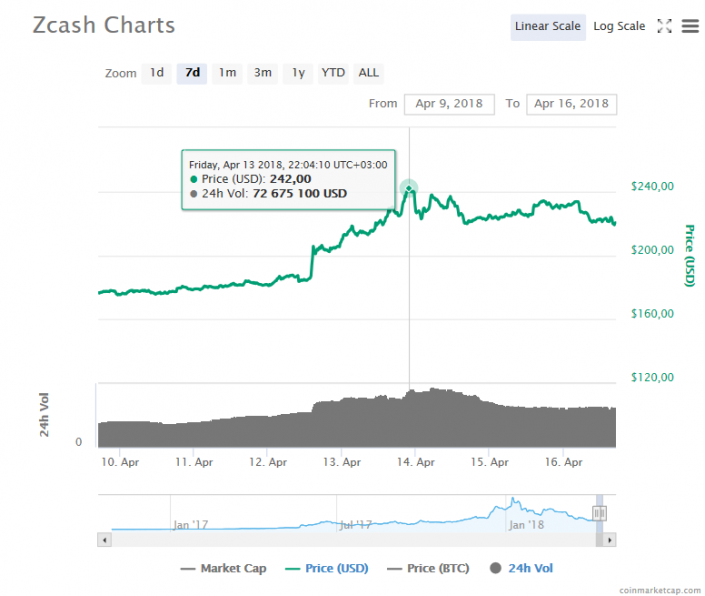 ZCash (ZEC Token) in 2018 – Up After It’s Security Upgrades? The ZEC token is one of the most private and decentralized type of tokens part of the ZCash Foundation’s blockchain project. But after it reached it’s all time high, the token has seen a lot of changes, which do raise suspicious of an upcoming price increase. But will ZCash continue BitCoin’s idea of an equal, private and decentralized future or will it remain another one of those tokens which many keep feeling uncertain in investing into. Judging by the last 7 days, ZEC Token’s price has remained stable after it sharply increased and passed the $180 line and then sharply rose to $242.00. The ZEC Token has steadily been going down ever since and kept the resistance level of $200 with a stable price. And when it comes to events, 3 days ago on April the 13th, 2018, news broke out on Coindesk that the crptocurrency is very close to compete it’s ceremony which involves the community of ZCash to create a random code for it’s privacy protocol in order to make It more secure. This community event will also reportedly help to get rid of the cryptographic code which used to secure the protocol which will likely be destroyed by wiping the machines which are utilized for data creation. This event does speak a lot about ZCash’s intentions in the future to create something that is close to it’s community and prevents malware authors to attack the protocol, which is more likely to happen with centralized cryptocurrencies. The ZEC token and the ZCash foundation has been created to be a decentralized and open-source cryptocurrency which strives into providing strong protection of the user’s privacy via encryption. The protocol uses strong encryption to conceal the sender of a transaction the receipient and the value of the transaction. And not only this, by ZCash also aims to be the improved version of BitCoin with higher and newer security protocols implemented within it, which traditionaly do not exist with BitCoin. An while the ZEC Token is currently enjoying a large community of contributors, holders, investors and miners, many of them do not seem to understand how exactly the protocol works to hide their information. This brings us to the “now” moment where ZCash have decided to implement their privacy ceremony which allows developers, members of the community and other people who contributed to the project to just create a random code for it’s updated privacy protocol, which will renew it’s security and make it even more private. And after the project has completed, each member has been able to input their own part of the security protocol. And while this is good news, it does raise some questions about the cryptocurrency’s code being changed, since there was nothing wrong with the old one. And more to this than that, will the newer features which are promised to be introduced by the “Sapling” upgrade actually be able to disclose payments and transactions of ZEC tokens? As many do believe, this is completely viable and possible way to create “a new BitCoin”, but is this really a good idea, since BitCoin was primarily used for other, not so legitimate purposes as well, so with this move ZCash does attain the sole principle of cryptocurrencies – decentralization and privacy, but does raise awareness of those fundamental problems, concerning anonymous and illegal activity, which is the sole issue that the government has. Other than that, the ZCash cryptocurrency with it’s ZEC token has the actual potential to shoot up to the sky in terms of price, if the projects keeps gaining momentum and user trust. But since ZCash is a highly volatile investment object, we always advise that you follow it’s developments and price regularly and always follow any updates that might occur on it’s social media profiles and news sites.